Working with fantastic vendors is a must when doing wedding photography. When we photographed Miranda at her session in Northern Utah, we were thrilled to work with some of the finest in the business. Carrie Purser is an incredibly talented hair & makeup artist. We were fortunate enough to watch her process before the shoot. It was about 3 hours from start to finish. Miranda arrived as a blank canvas for Carrie to work on. We didn't starting photographing the wonders until she had her hair mostly done and the beginning stages of the makeup done. Carrie truly is an artist - she uses her hands as a palette! It was incredible to watch her work. 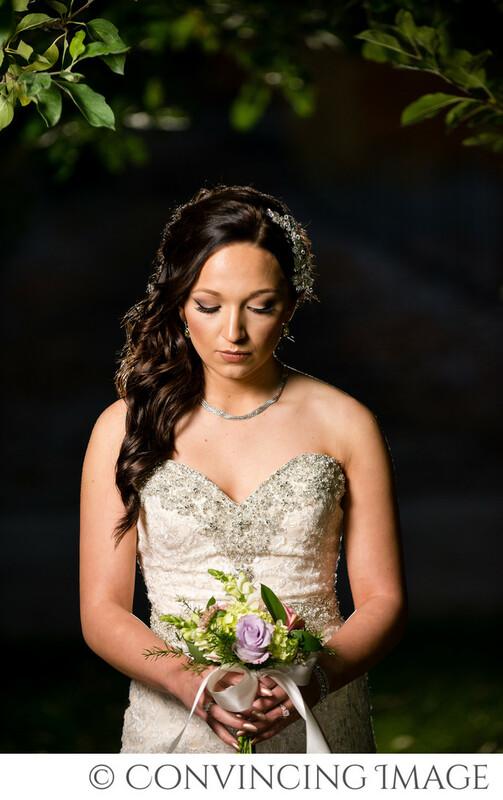 Miranda's dress and hair piece came from Petals & Promises Bridal in Logan, Utah. The hair piece added a beautiful touch to the already amazing hair. Just enough sparkle to add an interesting element. For this shoot, we chose a small, but elegant bouquet from Sego Floral. We decided to add the flowers as an afterthought the same day, and Sego managed to create this beautiful arrangement in very little time. Jerrick's Fine Jewelry provided the necklace and earrings. Although they were simple, it added to the class of the whole shoot. As the bridal photographers, we like to add our own touches of class. We often like to use a hair light to help the subject pop off the background. For this photo, we chose to keep it very light, just a touch of shine. Location: Zollinger Tree Farm, Providence, Utah. 1/200; f/3.5; ISO 1250; 150.0 mm.